Dashboard redesigned from the ground up. Added "Flat categories" - a new Vanilla-exclusive feature. OAuth 2.0 basic addon support. We also made hundreds of enhancements and fixes over the last 9 months. Rebuilt our category management system to scale to tens of thousands of categories. Rebuilt our permissions system to scale to thousands of custom permissions. Major overhauls to the addon manager and dispatcher. Faster and easier to use. Tagging and the MediaModel were added to core. Upgraded PHPMailer and Smarty (from 2.0 to 3.1!). Refactored our password management into separate dependencies. Move transient key checking to cookies. Replace "Hide Category" with "Mute Category" option (that only hides from Recent Discussions). Smarty 3.1 can be more strict. It may generate an error on invalid markup that Smarty 2.0 would have let slide. The new addon caching system means you need to manually delete /cache/* when changing what themes or plugins are available on your site. We are working on a better way of handling this, hopefully before final release. The new categories system may have unexpected results in page layout if you didn't specify a "Display As" setting for all your categories. If your homepage has weird issues, try editing your categories and checking this setting. 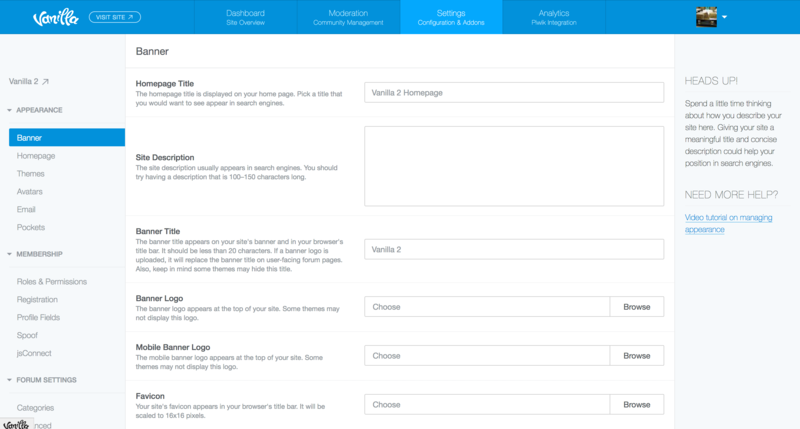 Plugins with settings pages need to be updated for the new Dashboard. They're gonna look real bad until then. UPDATE: You need to delete these: applications/vanilla/controllers/class.settingscontroller.php and applications/vanilla/views/settings (entire folder). Symptom will be the new dashboard not working correctly. (And high five to @R_J for catching this in the comments below). Vanilla 2.5 is expected in late 2017. It will require PHP 5.6 and will include a new internal API. We use it in production, but it hasn't been vetted for all platforms so we recommend extreme caution. You could run into backwards compatibility issues and other hiccups in the upgrade process. As always, back up everything before installing and do so in a place where it won't be an emergency if something goes wrong. Please test it out in a safe place that replicates your production environment and report back with details and results (including your hosting provider, PHP version, MySQL version, and server software & version). You can fill a Flat category with hundreds or even thousands of child categories. Instead of a typical category view, they'll paginate! This lets categories scale in exceptional ways. Let's say you're a book publisher with thousands of titles and want a category for each one. Flat categories is how to make that happen. Vanilla now includes a "Flat category module" for embedding this style of categories on other pages, and includes an auto-complete search box for faster navigation. How do I update my plugin to match the new Dashboard style? We put together a comprehensive styleguide, and it's bundled right into Vanilla at /applications/dashboard/styleguide. Oh my goddddddddd, so good! Note there are dated milestones for all of them. It can take 2-4 weeks to schedule an indepth task. The sooner you find a blocker bug, the less likely it is to have a delaying effect on the release. So don't put off testing. Can you include a way to put links insaid of category listes?!?!?!? There is a problem whit the categorys adress , it is shows like this : "http://roboticants.com/discussion/4/theme-black-ant-1-0"
Wow the new dashboard is so fancy, I love it. Great work everyone! I can access the Dashboard just fine so have I missed something along the way? What is the "Flat categories" about? Beyond my comment explaining it above? Did you have more questions? Ops... sorry I didn't see it. I have some plugins that appear in the plugins folder but are not visible in the dashboard. One example of this is the "FileUpload" plugin. Is there anything that needs to happen to make these "missing" plugins appear? So my "new" forum is a copy of my old one just running Vanilla .24. If I look in the dashboard on my "old" forum I see 34 plugins with 17 showing enabled and 17 showing disabled. What do I need to look for to identify why the missing plugins aren't being shown? Thanks R_J; I deleted addon.php and can now see those "missing" plugins!